1. 'Run Like No One is Watching' Jumper: Okay, so just how cute is this jumper? In a gorgeous peachy pink shade, it has an awesome motif, reflective details and thumbholes. I think it'd be perfect for running (well, duh) or just going to and from the gym. 2. Floral Water Bottle: Whilst this isn't technically workoutwear, everyone knows a water bottle is the ultimate must-have accessory at the gym and so I had to include this ADORABLE one from Cath Kidston. Their new workout range is basically DA BOMB and this nifty water bottle has a fruit filler thingymajig in it too so you can have fruit-infused water to be ultra fitnessy. 3. Floral Leggings: Can you sense a theme here? 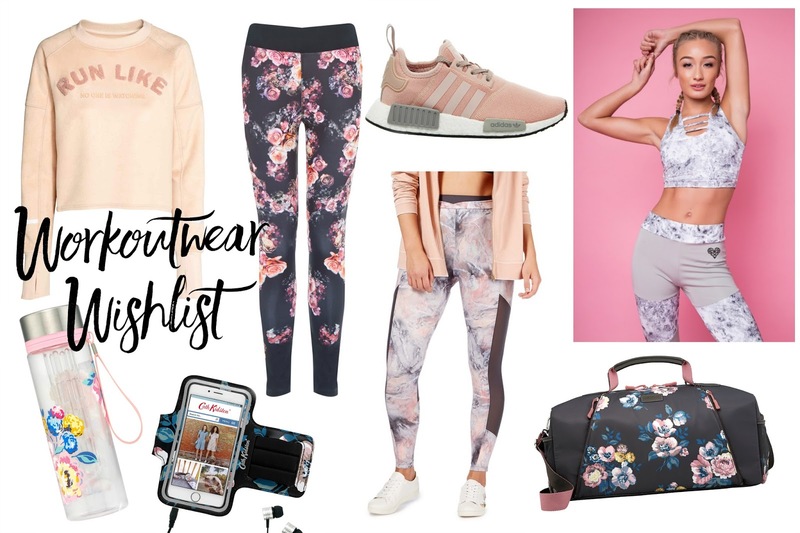 Well, you all know how much I adore florals, so when I saw that Oasis had collaborated with Pineapple Studios on an amazing range of floral fitnesswear I just may have done a little happy dance. It's very similar to the Cath Kidston range but perhaps a tad girlier, and these leggings are just to die for. 4. Floral Phone Armband: If you want to look uber chic when working out, this phone armband from the Cath Kidston range has got to be a must-have. I don't really use an armband if I'm in the gym, but definitely think they're essential if you're into running. I just think I run faster with music in my ears! 5. Adidas NMD x Offspring Trainers: Okay, so I'm only really putting these in because they go with the colour theme of the rest of the products, and yes they are gorgeous, but £200 for a pair of trainers? U serious? I'm not down with that. I do think they're all kinds of beautiful but I'd recommend scouting out the Office/Schuh sales if you're looking for a new pair of trainers - I managed to bag my dream Nikes for £30! 6. Nine by Savannah Miller Leggings: The Savannah Miller collection at Debenhams is honestly so dreamy. Marble prints, peaches and greys make up this gorgeous range and these marble leggings are stunning. I'm not entirely sure I could pull them off, but they are just too nice not to include. 7. Marble Triple Strap Sports Bra: Sticking with the marble theme, this cute bra from the Charlotte Crosby x In The Style fitness range is so pretty and affordable too. I love the leggings as well but they've sold out - not that I could get away with them anyway! 8. Floral Gym Bag: Another Cath Kidston beaut, I am head over heels in love with this gym bag from their fitness range. I don't really need a gym back right now, but I do think this would make a super cute overnight bag too. And that's my workoutwear wishlist! What workout clothes are you currently lusting after? Let me know!